Chilling Adventures of Sabrina season 1 episode 1 takes place during the days leading up to Halloween in the town of Greendale. This particular Halloween is special because there will be a blood moon lunar eclipse. For Sabrina Spellman, it is also her 16th birthday, when she is excepted to undertake her Dark Baptism and become a full-fledged witch. The only problem is that as a half-witch and half-mortal, Sabrina is torn between the life she’s always known and the potential divergent lives that lie ahead of her. Sabrina was raised by her aunts Hilda and Zelda following the death of her parents. Sabrina’s father, Edward Spellman, was a warlock and instructor at the Academy of Unseen Arts. Her mother, Diana, was a mortal. Hilda and Zee have been raising Sabrina as a witch at Spellman Mortuary, preparing her for her Dark Baptism, when Sabrina will cast aside her humanity, sever all ties with mortals, leave Greendale to attend the Academy, and fully become a witch. More than just a penchant for the macabre, Sabrina enjoys witchcraft. She turns to her cousin Ambrose to assist her with a spell to terrify her principal away from the school for a few days. Sabrina relishes the thought of more “gifts”. Sabrina wants to make her father proud of the witch she’s becoming and to live up to her aunts’ expectations. At the same time, Sabrina has grown up with her mortal friends in Greendale, and doesn’t want to leave them behind. When her friend Susie is assaulted by players on the football team, Sabrina hurries to start a club for the ladies at Baxter High School, so that the ladies can support one another before she leaves. Compounding the issue is Harvey, Sabrina’s boyfriend. Days before her 16th birthday, Harvey professes his love for Sabrina. Not wanting Harvey to be surprised by her disappearance, Sabrina tells Harvey about her dual life and that she will be leaving on her birthday, but makes Harvey forget everything she said because it is too heart-wrenching for the both of them. Sensing Sabrina’s hesitation, the Dark Lord sends a witch to help Sabrina choose the Path of Night. The witch comes out of Greendale’s haunted woods, where 13 witches were hanged in 1692, and is picked up on the road by Baxter High School teacher Ms. Wardwell. The witch kills Wardwell and takes her appearance. Under the guise of Sabrina’s favorite teacher, Wardwell nudges Sabrina toward a life of witchcraft, going so far as to animate a scarecrow and attack Sabrina in an attempt to keep Sabrina from eating from the fruit of knowledge. Sabrina is also visited by the Weird Sisters, three witches from the Academy who try to bully Sabrina from choosing a life of witchcraft. They despise half-breeds like Sabrina, which exist outside of witch law. If Sabrina chooses the Academy, then she will have to face these mean girls on a daily basis. Hilda and Zee believe that talking to someone in the Church of Night would help convince Sabrina to undergo the Dark Baptism. The closer to the Dark Lord, the better. As Sabrina returns home to announce her decision, she finds her aunts and Ambrose hosting Faustus Blackwood, the leader of the Church. Faustus tells Sabrina that he understands she is having second thoughts about joining the Church and is there to see what he can do to convince her. 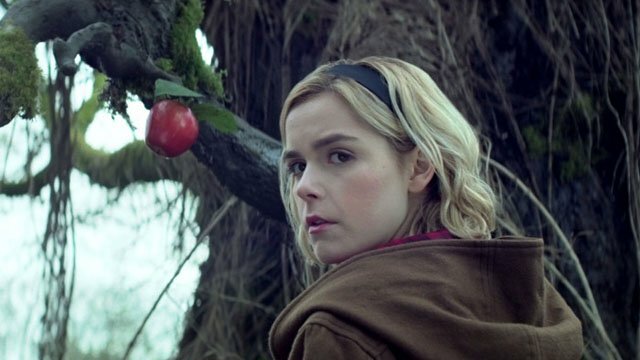 What did you think about Chilling Adventures of Sabrina season 1 episode 1? Let us know in the comments below! 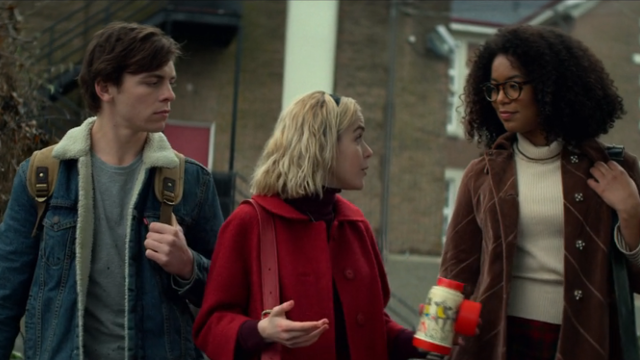 The post Chilling Adventures of Sabrina Season 1 Episode 1 Recap appeared first on ComingSoon.net.